Google has added a new tool to its Google Music Labs effort, called Song Maker. 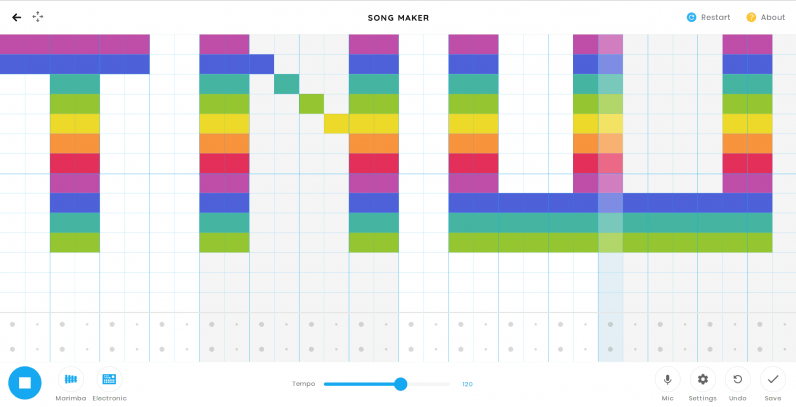 As you’ve probably figured out, Song Maker allows you to make songs. Everything happens in the browser. You’re able to define a sequence of notes from a chessboard of sounds, and Song Maker loops over them repeatedly. Think of it as a bit like a massively pared-down Yamaha Tenori-on, but running within the confines of the browser. Song Maker also lets you connect a MIDI keyboard, add percussion, sing over your track, and share it with your friends. As someone with precisely no musical skill, I do appreciate the fact that I don’t need to know anything about music to write a song. I can experiment by throwing notes together, and hoping for the best that they work. Google Music Labs is an amazing resource for budding melody makers, and offers an array of browser-based tools for crafting tunes. The company says it’s launching Song Maker in harmony with Music in Our Schools Month, which is an initiative of the National Association for Music Education. And yeah, it’s pretty sweet, but it’s no Microsoft Songsmith, is it?